For the more astute, I did say that this post would be George Harrison’s “Somewhere in England” album, however, as I began refreshing my knowledge in order to write this post, I discovered that that album wasn’t released until 1981. The album released in 1979, was the one named after him, George Harrison. I apologise for getting my rock facts wrong on this one and I will visit the “Somewhere in England album when I get to 1981. Anyway, enough of the history lesson, (sorry once a teacher always a teacher) let’s get on to the subject of this album. 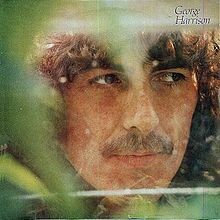 “George Harrison” by the person of the same name is a good soft rock album. It begins with an introductory guitar solo from the legendary Eric Clapton on the first track, “Love Comes to Everyone” and carries through the album with a feel good factor throughout. There’s the top single “Blow Away” which, for those who take the singles charts seriously, made it to number 14 in the US and 39 in the UK. The song “Faster” has a bit more of a rock feel to it, especially as it begins with motor racing sound effects. “George Harrison” for me was common ground for me and my then disco/plastic pop loving girlfriend at the time. Still it’s a good album to “mellow out” to. One I listen to on a lazy summer day, like today and shows why I’ve always said that Harrison’s work has always been underrated when compared to the other Beatles. This entry was posted on July 28, 2012 at 9:17 am and is filed under 1979, Music, Rock with tags Classic Rock, George Harrison, John Lennon, Mellow out rock, Paul McCartney, The 1970s, The Beatles. You can follow any responses to this entry through the RSS 2.0 feed. You can leave a response, or trackback from your own site.